Offering a wide-angle Leica lens, very good image quality, a big LCD, and excellent battery life, Panasonic’s Lumix DMC-FS25 is a great well-rounded pocket camera. It does cost a shade more than the competition (the suggested retail price is $250), but it’s available around the Web for closer to $200. A few distinguishing characteristics make it a phenomenal buy if you can find it at that $200 price point, as well as a great value for $250. One of them is Panasonic’s Intelligent Auto mode, which actually consists of six in-camera features working in tandem: optical image stabilization, ISO optimization, automatic scene selection, backlight correction, red-eye correction, and face detection. Rather than having to dive into the menus to choose this mode, Panasonic put a dedicated Intelligent Auto button right next to the shutter button to turn it on very easily. It’s a very handy feature, a great idea to have that mode easily accessible, and Intelligent Auto mode did a good job of selecting the right settings in my informal tests. Part of its success is the excellent optical image stabilization, which kept the image crisp both when zoomed in to the max and when I shook the camera around dramatically. Adding to the camera’s list of key draws is its wide-angle chops: a 5x optical zoom Leica lens that reaches from 29mm to 145mm. Also a great feature for a camera in this price range is the AF Tracking mode, which lets you lock in on a moving subject and keep it in focus as the subject (or the photographer) moves around. In my informal tests, it worked best with bright, solid colored objects; coupled with the optical image stabilization, it’s a handy feature for those who want to shoot sports or action scenes. A few unique selections are among the 21 scene modes. You still get the old standbys, such as Portrait, Sports, Scenery, Sunset, and Fireworks, but rare options such as Pinhole (which mimics the effects of a pinhole camera), Film Grain (which applies a gritty black-and-white filter), and Photo Frame (which puts teen-centric, partytime borders around your shots) are also in the mix. Other in-camera features include a burst mode that shoots about 2 images per second, manual and pre-set white balance selections, and seven different “color” modes that apply effects such as sepia tone and vivid colors. In jury evaluations run by our lab, the DMC-FS25 received top scores for image-quality scores. Color accuracy, exposure quality with the flash turned on, and image sharpness were all notable strong suits, earning it an overall image quality score of Very Good. Battery life is also excellent. The DMC-FS25 netted 320 shots on a single charge of its rechargeable Lithium ion battery. Most other cameras in the $200 price range top out at about 250 shots per charge. Those who share Steve Jobs’s disdain for physical buttons will meet their nemesis in this camera. The DMC-FS25 does its thing with a combination of buttons, switches, and a four-way navigational mini joystick. That makes most functions a no-brainer to find, but the mini-joystick (which also doubles as one-touch access to exposure compensation, flash, self-timer, and macro mode) is a bit small and finicky to use if you’ve got big hands. In addition to the joystick, four buttons join the big, bright 3-inch-diagonal LCD on the back of the camera: a button to access the camera modes, a display button that offers different looks for the viewfinder, a menu button, and a delete button. There’s also a toggle switch above the buttons to jump between capture and playback modes. Another toggle switch for powering the camera on and off rests on the top of the DMC-FS25; next to that is the shutter button and zoom ring, as well as the aforementioned Intelligent Auto button. The DMC-FS25 has a 3-inch LCD. When it comes to shutter lag, the DMC-FS25 captures shots instantly just as long as you autofocus before snapping. There is about a second of shutter lag if you don’t autofocus first and simply press the shutter button. The DMC-FS25 also records standard-definition video, but like many point-and-shoots, you can’t zoom in and out while filming. Video is captured as .mov files at 848-by-480, 640-by-480, and 320-by-240 resolutions, all at 30 frames per second. The DMC-FS25 an understatedly good-looking camera, too, although the brushed-metal faceplate looks a bit more solid than it feels. On the upside, the camera is a bit lighter than it would appear to be, but it does have a slightly hollow feel. The camera is available in silver, black, and champagne gold. As with any tech purchase, it’s best to try the Lumix DMC-FS25 before you buy it, thanks to the love-it-or-hate-it mini-joystick that you use to access most of the menu functions. That’s really the only main drawback of this camera, which offers a wide-angle lens, fun features, a huge LCD screen, and great battery life for the price. 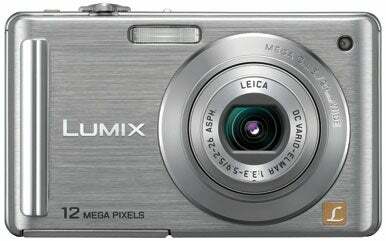 If you can find the Lumix DMC-FS25 around the $200 price point, it provides excellent value for the money.